Do you have a little cowboy at home who wants more boys' applique shirts? Aside from making them yourself, you'll have to search for original applique shirts for kids. Whether you pick a plaid shirt with embroidery or a fun desert-theme shirt for a boy instead, they can all be paired with jeans, overalls, or play suits. What if the kid you are shopping for happens to like cowboy hats? They'll match perfectly! Applique shirts come in many different styles, and thanks to home sewers thinking up new designs on a regular basis, you'll always find fresh looks when you're stocking a child's closet. Hooded Shirts: A shirt with a hood is perfect for layering with vests for children. Try hooded shirts underneath down or denim vests, depending on the climate. 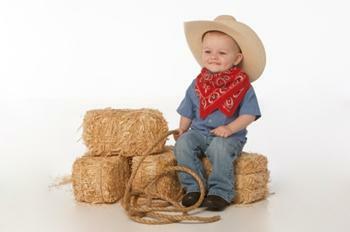 Western-Style Button-Up Shirts: Western-inspired shirts are great for that kid who wants to wear a cowboy hat and boots! These shirts could have Western designs on them, but they can also feature appliques on a plaid, long-sleeved shirt. Tees: Plain T-shirts are one of the most popular appliqued items for kids. If you're crafty enough, you can make your own applique shirt in several different ways. These tips can lead you in the right direction when it comes to developing your own appliqued design. If you know how to sew by hand, cut a silhouette out of fabric or felt to use on a plain T-shirt. Whipstitch or box stitch the silhouette on the T-shirt, and then add further embroidered details as you see fit. Buy iron-on transfer material at any craft supply store to make a homemade applique-style top. You can print out an applique on the transfer paper and then apply it to the T-shirt using an iron. After you apply it to the T-shirt, add fabric glue or embroidery as edging, and you are done. Appliqued shirts can get damaged when washed with the wrong pieces, so these tips will keep the shirt looking fresh longer. Tip 1: Be sure to read the care tag on an appliqued garment. Some appliques cannot be ironed, and if you do so, you will damage them irreparably. Tip 2: Wash an applique shirt in a special lingerie mesh bag, or turn it inside out before washing on the cold, delicate cycle. If your child usually stains his or her clothes, try soaking the garment in a detergent solution before tossing it in the washing machine. Tip 3: Use different colors of embroidery floss to repair an appliqued garment without having to take it to the seamstress. You can whipstitch the edge of a peeling-off applique extremely easily, and as certain spots wear out, simply use more embroidery floss. You'll find a wide variety of boys' shirts, from Western-inspired versions to shirts with a cartoon style splashed across the front and back. While many shirts have appliques across the front yoke design, a smaller percentage of kids' shirts will have more intricate all-over designs. Buy appliqued shirts at these locations to start. Boden carries a nice selection of applique shirts with themes like music, friends, sport, animals and more. Zappos has one of the biggest selections of these shirts in a variety of sizes and styles to suit boys of different ages. GAP carries simple styles for kids who like to dress casually. These shirts won't be particularly fancy or flashy, but kids love wearing them just the same. Janie and Jack carries fun tees with appliques that usually feature a singular, attention-getting design. These tees will feature something like a moose or a sneaker, surrounded by a fun slogan or logo in simple writing. Boys' applique shirts are readily available in the right locations. Don't forget that many little boys like these, so they can even be good holiday presents.